Two young Dublin men, Seán Farrell and Ciarán Maguire, currently face extradition to the Six Counties on foot of a European Arrest Warrant served by the Police Service of Northern Ireland in March 2017. If their request is successful, Seán and Ciarán will face trial and potentially lengthy prison terms in Co. Antrim’s notorious Maghaberry Prison where republican prisoners have for many years been subjected to forced strip searches, systematic beatings and held in isolation for prolonged periods of time. Events over recent weeks in relation to British state violence and collusion in Ireland have also amply demonstrated that there has never been a “new beginning” to policing and justice matters in the Six Counties. 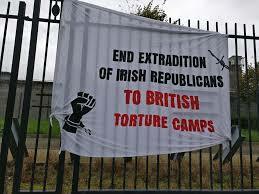 Given the British state’s long history of human rights violations and its continued attempts to cover up its role in colluding with loyalist death squads in the murders of hundreds of nationalists, it would be a travesty of justice to extradite a republican to face its so called “justice” system. To mark the 50th anniversary of the civil rights movement in the six counties last year, Blindboy Boatclub of the Rubber Bandits hosted a podcast at Ulster Hall in Belfast on October 6th 2018. 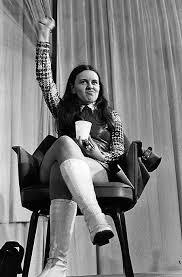 He interviewed veteran Irish revolutionary Bernadette (Devlin) McAliskey in front of a packed room. The podcast is over two hours long. In this part he poke to her about the loyalist attempt to assassinate her and her husband Michael on January 16, 1981. At the time, Bernadette was a key figure organising support for republicans being held in British prisons, including the blanket protest, the dirty protest, and the 1980 hunger strike. 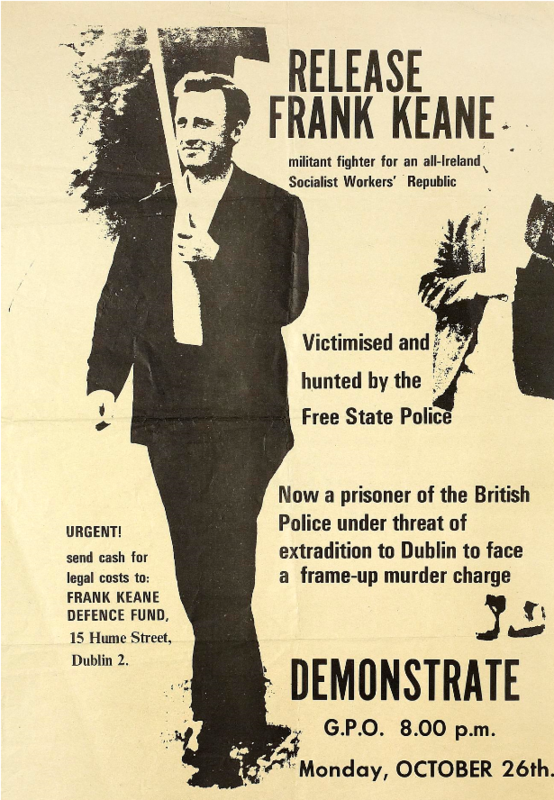 At the time of the attempt on her life, a new hunger strike was in the air – this was the famous hunger strike of that era, with ten prisoners’ deaths. The entire interview will be published on The Transcripts. Blindboy: When we were backstage I was asking you about, we were discussing the nature of trauma and I was asking would it be okay if I asked you about the time you had an assassination attempt. And you said: Yes, that would be okay. Bernadette: Uh-huh. Yep. That’s okay. That’s okay. Yeah. Blindboy: Can we talk about that? Bernadette: Yes, we can talk about that. Blindboy: So – what was it like being shot nine times? Bernadette: It was interesting. It was interesting. And it’s funny that I can talk about that much more easily than I can talk about that memory, you know, that memory of Bloody Sunday is more traumatic for me than the time that I was shot. And I think it was because, you know, as we were saying, it’s because I didn’t see Bloody Sunday coming. I didn’t see the 5th of October coming. 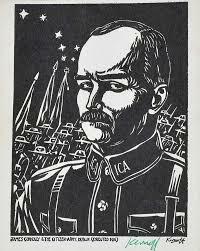 The article below was written by Connolly and appeared in the paper Workers Republic, October 30, 1915. The version below was transcribed in 1997 by the James Connolly Society and appears in the Connolly section of the Marxist Internet Archive. 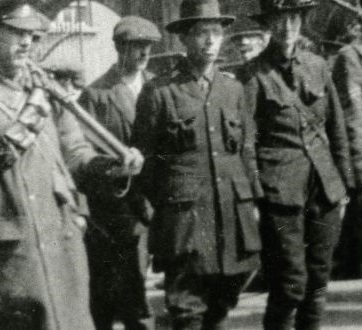 The Irish Citizen Army was founded during the great Dublin Lock-Out of 1913-14, for the purpose of protecting the working class, and of preserving its right of public meeting and free association. The streets of Dublin had been covered by the bodies of helpless men, women, boys and girls brutally batoned by the uniformed bullies of the British Government. Three men had been killed, and one young Irish girl murdered by a scab, and nothing was done to bring the assassins to justice. So since justice did not exist for us, since the law instead of protecting the rights of the workers was an open enemy, and since the armed forces of the Crown were unreservedly at the disposal of the enemies of labour, it was resolved to create our own army to secure our rights, to protect our members, and to be a guarantee of our own free progress. The Irish Citizen Army was the first publicly organised armed citizen force south of the Boyne. Its constitution pledged and still pledges its members to work for an Irish Republic, and for the emancipation of labour. It has ever been foremost in allnational work, and whilst never neglecting its own special function has always been at the disposal of the forces of Irish nationality for the ends common to all. We asked former H-Block prisoner and blanketman Dixie Elliott for a review of this movie. Dixie suggested we use something he had written that appeared on The Pensive Quill; so this is it with some slight editing to fit this site. I Dolours, 2018, directed by Maurice Sweeney; produced by Ed Moloney; 82 mins. I Dolours is a film about a committed and brave IRA Volunteer telling her own harrowing story. What struck me was the haunted eyes of someone who, like her sister Marian, carried out orders without question and who did terrible things in the belief that what they were doing was right. Who remained seated when asked to go and bomb England while others got up and walked out of the room, unable to do it. 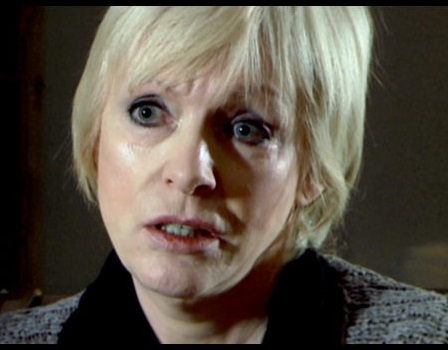 Dolours couldn’t understand why they didn’t want to go as she wanted to take the war to the Brits’ door. The Brits were waiting on them, she told us, and when asked if she believed there was an informer, she said “yes” without hesitation – in Belfast. The actor who portrayed Dolours as a young IRA Volunteer is so like the older woman it’s uncanny, especially the eyes. 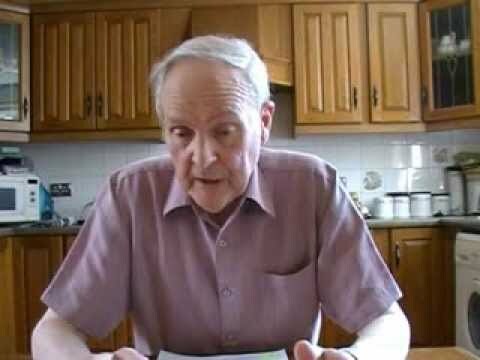 Last week I watched a video of a public meeting at the CP’s Dublin headquarters marking the 50th anniversary of the explosion of the civil rights movement onto the streets of Derry and the wider six counties. One of the speakers was Tommy McKearney, someone whom I respect a great deal. To my unpleasant surprise, however, Tommy wheeled out the old Stickies and CP attacks on “ultralefts” going destructively ahead with activities which unnecessarily provoked violent clashes instead of listening to the advice of more seasoned folk like Betty Sinclair. It’s hard to know where to start in responding to this, so I’m linking to two articles on the People’s Democracy organisation, the civil rights movement and Burntollet. One is by Matt Collins, from SWN/People Before Profit looking back on the events as a Marxist today and the other is by John McAnulty, a veteran of PD and the movement back then and an active Marxist still. John agrees with much in the Matt Collins article, which defends PD, while also noting a few things Matt got wrong. The following letter appeared in the October 26 issue of the Belfast-based Irish News. 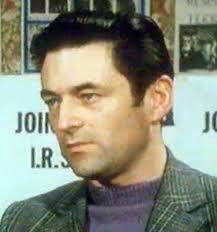 Bernard Fox spent decades in the Irish Republican Army, including a stint on the Army Council, the IRA’s seven-person central leadership. He came to oppose the direction the Adams-McGuinness cabal took as they decided to become part of the political establishment across the island. I commend The Irish News coverage of the emergence of the civil rights association and the events surrounding the Duke Street march 50 years ago. Leona O’Neill’s column (October 9) about her brave father’s involvement and decisions made then were made in response to what he experienced on the ground. However, at that time there were no easy decisions to make. The Orange marching season in the North of Ireland kicks off each year with Twelfth of July marches, preceded by the 11th night bonfires. This year the Twelfth demonstration passed almost without incident. The 11th night bonfires saw a rash of hijacking and petrol bombing in east Belfast and parts of County Down. These were protests following a court order applying fire safety rules to a bonfire. The Ulster Volunteer Force gangsters behind the hijacking believed as a matter of principle that the bonfires should be free of any legal impediment. They were a small minority. 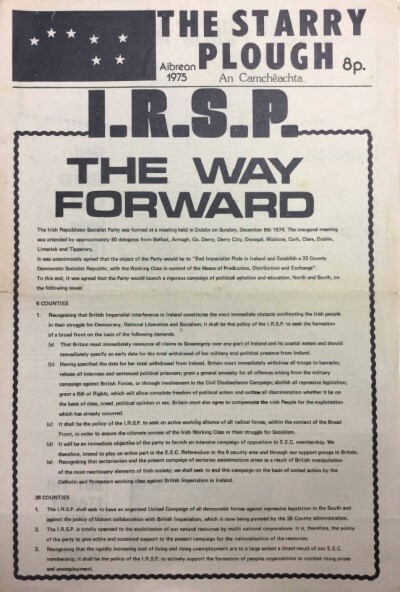 The unionist population was indifferent, the paramilitaries had been paid off and, for the first time ever, the Democratic Unionist Party stepped forward to demand obedience to the law.